Obamacare is not the only piece of Barack Obama's legacy that's under attack. 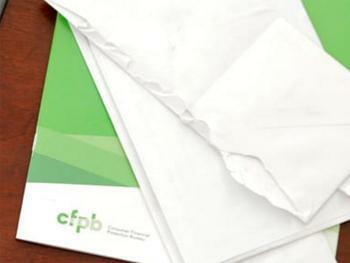 The Consumer Financial Protection Bureau is fighting a lawsuit that argues its structure is unconstitutional. Although the agency has returned hundreds of millions of dollars to consumers and cleaned up numerous predatory financial practices, it is not exactly a household word, and its defenders fear that a well-financed campaign by big business will succeed in weakening or even eliminating the CFPB. Coming to the bureau's aid are the attorneys general of 17 states who have filed a motion to intervene in the federal appeals court case that threatens the CFPB's continued existence. "The CFPB is the cop on the beat, protecting Main Street from Wall Street misconduct," said Connecticut Attorney General George Jepsen, who is leading the coalition. "It was structured by Congress to be a powerful and independent agency that would protect consumers from the abuses of Wall Street, banks, and other large financial institutions." The case – PHH Corporation, et al. v. Consumer Financial Protection Bureau – is currently before the United States Court of Appeals for the District of Columbia Circuit. In an October 2016 ruling, a divided court found the structure of the CFPB unconstitutional. The CFPB filed a petition for a rehearing of the decision, and that petition is currently pending before the court. The Trump Administration has said it intends to curtail the CFPB's authority, Jepsen noted. "Contrary to his populist rhetoric, the President's failure to support the CFPB would be a gift to powerful financial interests and a bitter broken promise to regular Americans he vowed to defend," Jepsen said. "Should the Trump Administration fail to adequately defend the CFPB in this litigation, state attorneys general – and the public – could lose the benefits of a powerful enforcement partnership." Among the issues being litigated is the governance of the CFPB. Similar agencies -- like the Federal Trade Commission and the Federal Communications Commission -- are governed by a panel of commissioners who serve more or less at the pleasure of the President. The CFPB was structured differently when it was founded in 2010, as part of an effort to make it immune from political pressure. Instead of a panel of commissioners, it has only a single director, in this case Richard Cordray, who was previously the attorney general of Ohio. Filing the motion were the attorney generals from Connecticut, Delaware, Hawaii, Illinois, Iowa, Maine, Maryland, Massachusetts, Mississippi, New Mexico, New York, North Carolina, Oregon, Rhode Island, Vermont, Washington, and the District of Columbia. Please click here to view the motion to intervene filed today. The full text of the motion is available here.